Today, Thursday 7th February, was the annual Brampton Consortium Schools Swimming Gala. We had 9 children entered for the competition and the event took place at, The Pools in Carlisle. The children were all excited as well as a little nervous about the races ahead but despite this they all performed brilliantly! The team was: Amber Thompson, Kiera Wilkinson-Scott, Michaela Tait, Kenzie Ridpath, Summer Wharton, Owen Wilkinson, Harley Dodd, Daniel Beesley and Max Starkey. 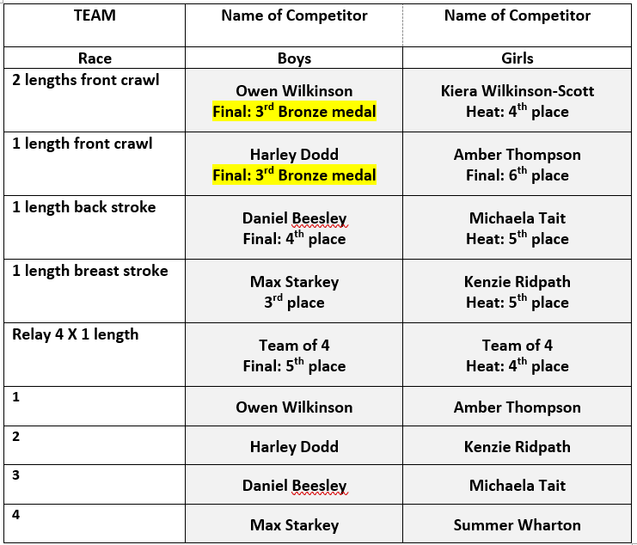 The children had to swim a heat in their allocated strokes and then the 6 fastest times went forward into the final of each event. The children performed brilliantly in many very close-run heats. Some of our children made it into the final, Owen being the first of them. He swam the 2 lengths front crawl and after qualifying in 5th place he swam incredibly well to finish in 3rd place in the final! Next up was Harley, who qualified in 4th place, and he also swam brilliantly to push himself into a comfortable 3rd place. We also had good results in the 1 length backstroke and front crawl races with Daniel and Amber finishing in 4th and 6th place respectively. Finally, to the relays… the girls swam well in their heat to finish in 4th place and the boys, after a blistering final leg from Owen, just touched the wall for a joint 2nd place. This put them through to the final where they fought hard against some tough opposition to hold their position for an overall 5th place. All of the children gave great performances and were always encouraging each other, showing great sportsmanship and clapping everyone home. I would like to say a huge thank you to the parents who came to support all of the children. Another afternoon both Mrs Jackson and I were able to enjoy with the children of Brampton Primary School!